Gulf Shores and Orange Beach, on the Gulf coast of Alabama, is one of my favorite vacation destinations. With gorgeous white sand beaches and turquoise waters, it’s a terrific spot for a family beach vacation. It’s also a fantastic foodie destination. 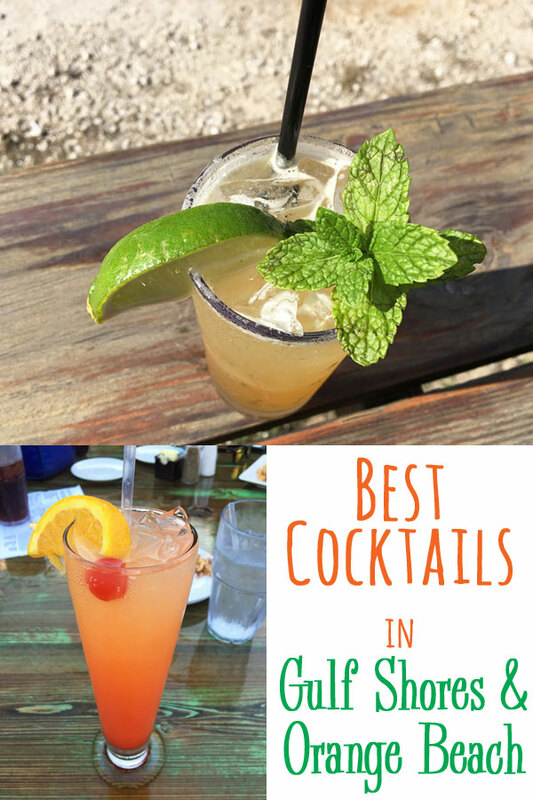 I’ve already shared some of my favorite restaurants in the area, and today I’m sharing my favorite cocktails in Gulf Shores and Orange Beach! The Ruby Sunrise is a mix of tequila, orange juice, and pomegranate juice, with a slice of lime and a half-salted rim. But that’s not all I drank at 9 am at The Ruby Slipper Cafe. I also had a Berry Mimosa and an Irish Cream Coffee. 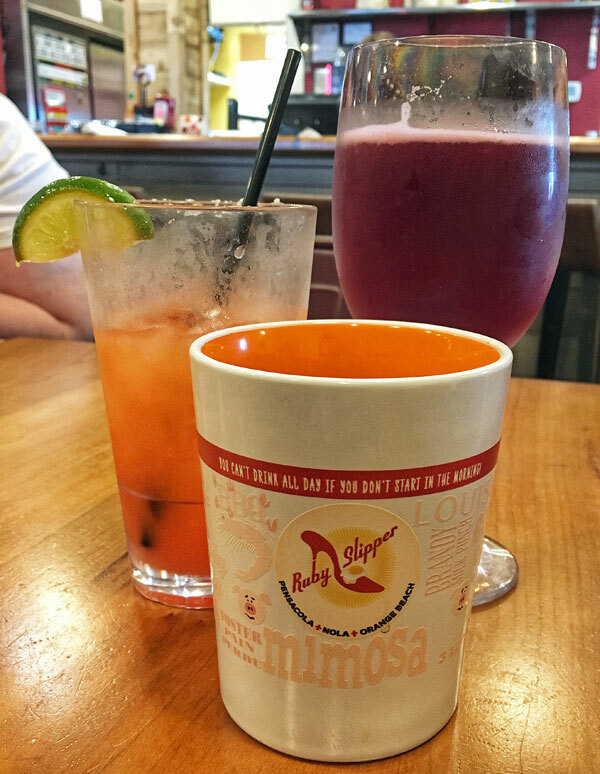 You can’t go wrong with any of their Big Easy Mimosas, Bloody Marys, or Morning Margaritas. And don’t forget the Pig Candy Bacon. It’s to die for! 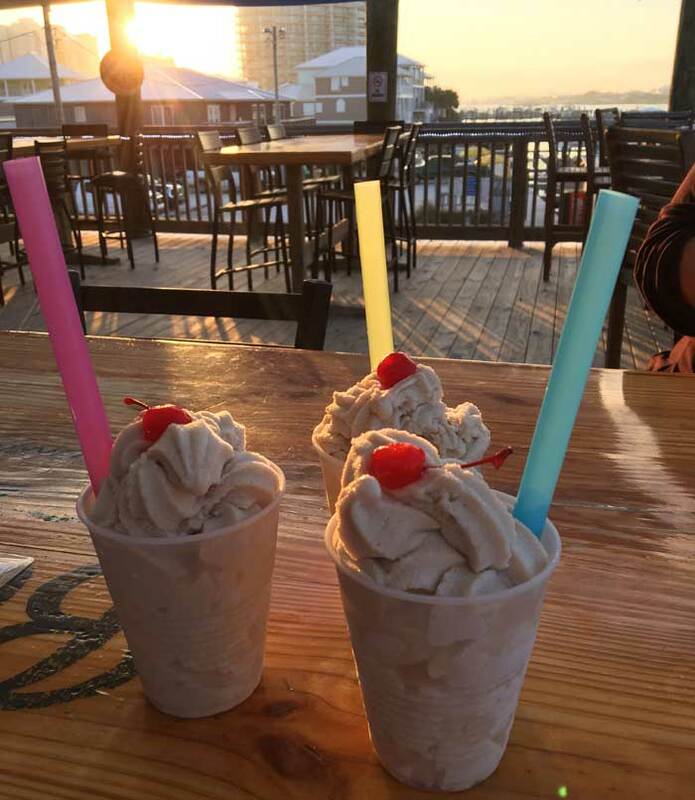 The mascot cocktail of Alabama’s Gulf Coast, the Bushwacker is made with coffee, rums, chocolate liqueurs, and vanilla ice cream, blended into a milkshake-like consistency. It’s the ultimate beach drink. I tried one at almost every restaurant. While it’s hard to pick a favorite, I think the Flora-Bama’s Ole River Grill made one of the best. The local drink you MUST try: the Bushwacker. The Royal Oyster is a cozy spot serving up fresh, local oysters prepared every which way. I love their laid-back vibe and large wood deck. It reminds me of a seaside shanty. Mini’s Maple Magic was my cocktail of choice here. 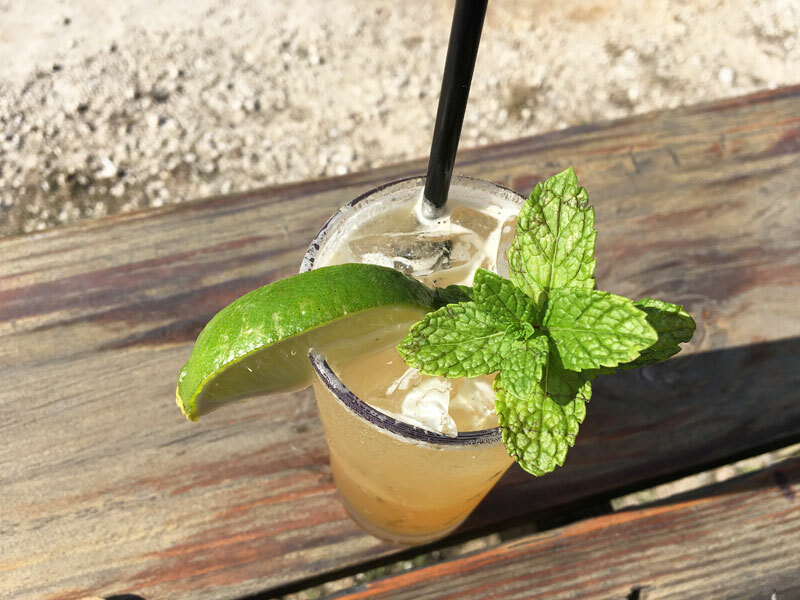 It’s a delicious blend of Maker’s Mark, Bourbon Maple Syrup, lemon, mint, and soda. Extremely tasty with just the right amount of sweetness. LuLu’s is not just a restaurant – it’s almost like a theme park. There’s a ropes course, an arcade, beach volleyball, hairwraps, henna, live music and several bars. Here I tried the Loopty-Lu. It’s a sweet twist on the margarita and made extra fun with the loopy, silly straw. 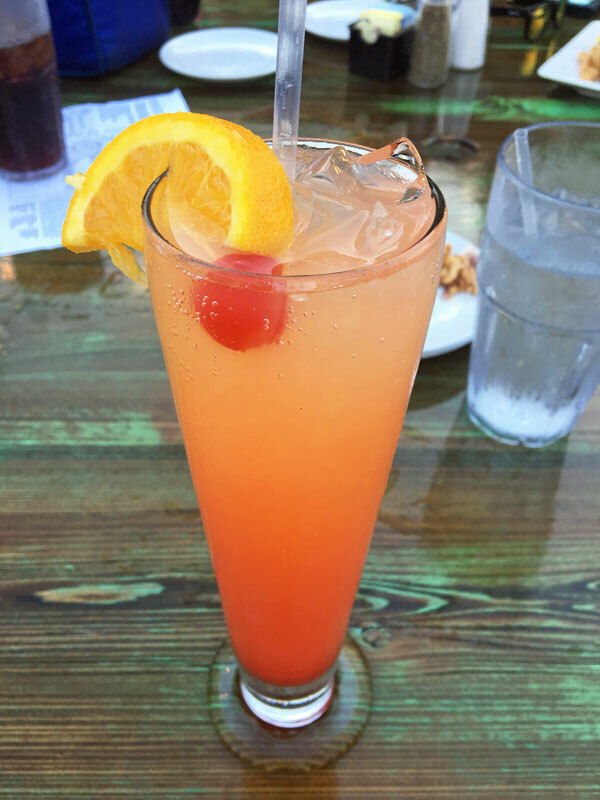 This cocktail is created with Margaritaville Last Mango Tequila, Deep Eddy Lemon, lemonade, sweet & sour mix, and a splash of Grenadine. 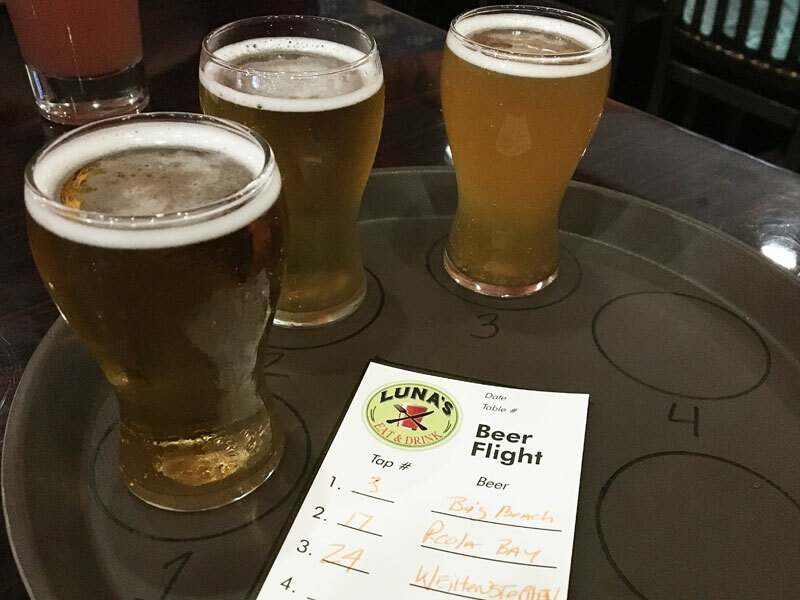 Happy Hour is from 2pm – 6pm daily, so stop at Luna’s and get yourself a flight. They have a huge selection of craft beers, many from local breweries. Luna’s is a family-friendly sports bar and restaurant that serves comfort food “with a touch of soul.” You must try their Tomato Pie or the Beer Cheese Dip! GT’s On the Bay is a beautiful waterfront restaurant where you can enjoy fun cocktails, live music, good food, and amazing sunsets. It’s also family-friendly with its giant sting-ray tank and outdoor playground. 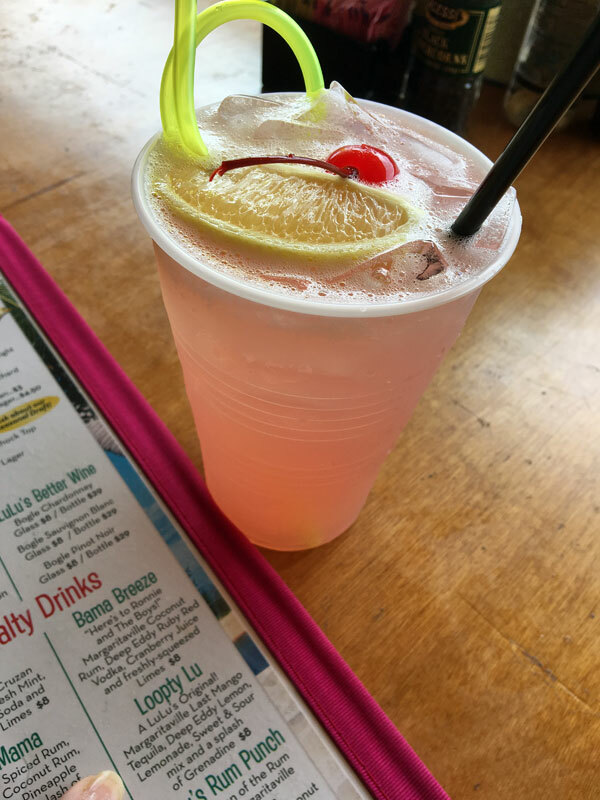 I had the Mom-osa at GT’s, because every mom deserves something a little extra. It’s like a mimosa, fruity and bubbly, but with Smirnoff Passion Fruit Vodka for a bit of a kick. It goes well with GT’s Dip, made with peppers, corn, bacon & cheese. The Gulf is the place to be for Happy Hour! It’s located on… yes, the Gulf, with stunning views, comfy outdoor couches and sandy seating areas. The outdoor bar is warm and inviting. Something about The Gulf just feels… right. You’ll never want to leave. 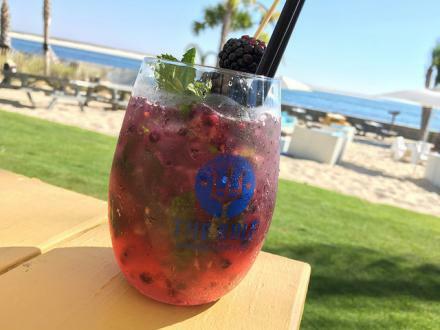 Their Blackberry Mojito is served in a clear cup with fresh blackberries, mint, and lime. It’s delicious, refreshing, and so Instagram-able! Fisher’s at Orange Beach Marina has two restaurants: Fishers Dockside for casual dining and Fisher’s Upstairs for upscale, fine dining. It is at Fisher’s Upstairs where I had my favorite cocktail of all time, the Yacht Rocker. Created with Luxardo Maraschino Liquer, rye whiskey, demarara, and blood orange bitters, the Yacht Rocker is a marvelous take on the traditional Manhattan. 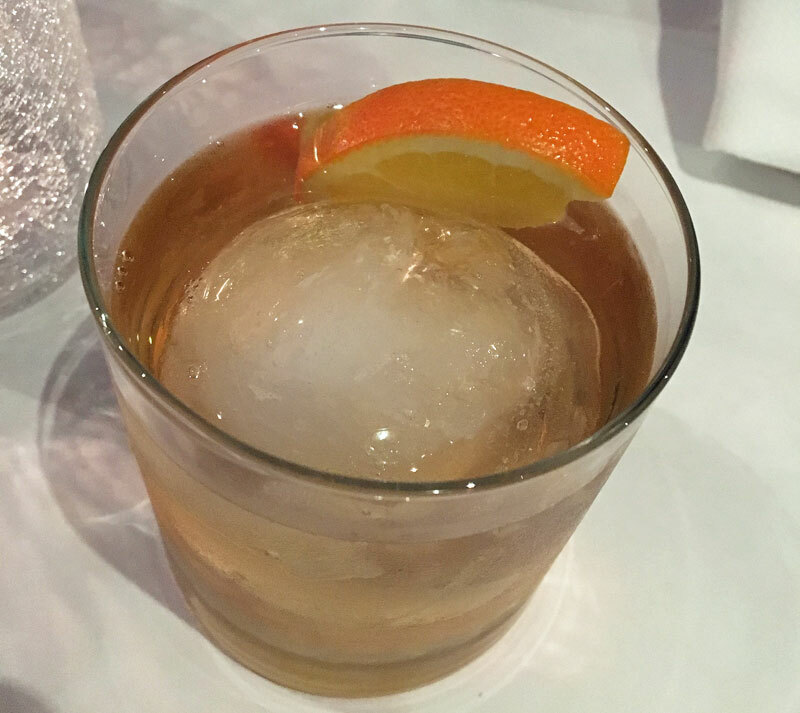 The drink was served over a ball of ice that effectively chilled the cocktail, but didn’t melt too fast and water it down. I loved the Yacht Rocker so much that I purchased the ingredients at home to mix up myself many times! Note: Last time I ate at Fishers Upstairs, this cocktail was not on the menu. But if you ask for it, they’ll make it for you. How about when you want to sober up from all those cocktails? Head to Southern Grind Coffee House. They’ve got some excellent Nitro Cold Brew to accompany your breakfast and give you a caffeine kick! Gulf Shores and Orange Beach has an overwhelming number of outstanding restaurants and bars. Every time I visit, I discover something new and it never disappoints. If you’re looking for a true foodie experience and unique craft cocktails, look no further.